And with that, July has come to an end and we are already a few days into August. Half the year is gone, and I have to say, things have been going very well so far. It’s very satisfying to see my mileage creep back up there. 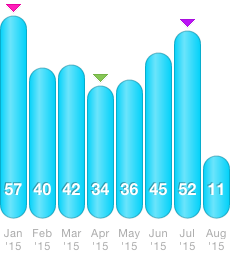 In fact, I was only a few miles shy of my total January mileage, making July my second runningest month in 2015. We left the hotel after a quick breakfast and started our drive to Winter Haven. Little man had absolutely no idea where we were headed and we managed to keep a surprise until we pulled up to this. That’s right! We were finally going to Legoland! After a wonderful night’s sleep, we took advantage of early admission to the park, but the weather wasn’t being incredibly cooperative. It seemed like the rain was going to come at noon, and you could see the dark clouds advancing, so Mr PugRunner suggested we just do a couple of the rides that were open and then head up to Universal Studios (since we have passes) and spend the rest of the day there. It was a long, but fun day. I’ll be honest, we were really happy to get home. I managed to get some decent sleep the night before and was ready for our sunrise group run. We did some serious pushing and definitely made up for the previous Thursday’s run. Little man went off to my mom’s and after work, I ran a few errands. We had a big day trip planned for the next day, and I had to get water shoes, some snorkel gear, and a few other things. I was really excited. I was up and on the road with coolers, beach chairs and swim gear by 6:15. I grabbed my parents and little man, picked up breakfast and sandwiches for lunch, and then embarked on the very, very, VERy scenic, two hour drive to High Springs. Our plan for the day? To visit Blue Springs Park. There are many natural springs in this state, and they are all remarkably beautiful. I have been wanting to go, but Mr PugRunner has been a bit reticent, so I just figured to seize the day and was thrilled that Nana and Papa Bear were willing to join in the fun. Little man had an early morning dentist appointment – I was planning to get in my run on my own before we left, but I ended up sleeping in a little and had to skip it. Three cheers for no cavities! Mr PugRunner and I were able to get in a couple’s run this morning. It’s so nice when we are able to make it happen. He had a pretty busy work day scheduled, but he was able to take off at lunchtime so we could pick up little man and share a meal with Nana and Papa Bear. Afterwards, they did a boys’ date to the movies while I chilled at home. It was a lazy-ish day. While Mr PugRunner was working, little man and I headed to the running store and Target, and then we all met up for lunch. Mr PugRunner had plans for a guys’ night out, so I joined my friend and her daughter for dinner at a waterfront restaurant, where a Polynesian Revue was scheduled. I didn’t want to be out too late because I had a long run on Sunday, but I didn’t expect little man to be so enamored with the show. It was fantastic, but we couldn’t stay out for the whole thing, and I finally was able to convince him to leave after about an hour. I promised him that we would catch another performance at a later date. I’m giving July two thumbs up. I had some solid miles in there, and I am feeling pretty strong in anticipation of our half marathon in a few weeks. Speaking of which, I think I finally settled on an outfit! I want to be bright and fun. Now I just have to decide if I need to wear knee-high compression socks or if I’m doing ok without them. 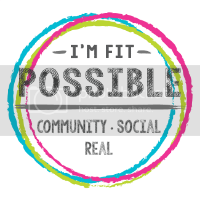 How was your week in fitness? Do you have any local sites that you want to visit but just haven’t yet? Congratulations! That is some serious mileage! I have heard great things about Legoland but never, been, it looks so fun! It was really fun. I don’t think it’s going to be age-appropriate for long (I think they say it’s good for up to age 12), but that’s ok. The park was really well done, and so laid back. you had such a fun week! there are so many things on my to do list in the chicago area that i just haven’t gotten to in the 3 years i’ve been there. like six flags! how have i not been to the chicago six flags yet?! How, indeed? Six Flags is great! I think when you live in an area that’s a more popular touristy spot, you tend to take for granted the local things to do and see. You wouldn’t believe how many people I know who have lived in (coastal) Florida their whole lives and never been to the beach. How does that happen? We love traveling, so I dug up some of those “18 Hidden Gems of Florida” buzzfeed articles, and I want to start checking off items. There are so many beautiful and awesome places, some of them practically in our own backyard. Silly not to take advantage of them. What a great week! TWO fun excursions! I can’t wait to read all about them. Stacie Seidman recently posted…Thursday’s Threads! I do love them! I have a few more coming, but they were on backorder. I like bracelets, but I hate taking them on and off. How lazy can you get? I love that sports bra. I have two in different colors and it is so comfortable. This is such a fun post, so refreshing. Sounds like an awesome week! Can’t wait to hear more about legoland! I can’t wait to share. We really enjoyed it. Looks like so much fun and a good week of training considering you were having so much fun I am on week 2 of my BODYSHRED program. It’s always a challenge to figure out training around vacation, but we do the best we can. I keep meaning to check out the Freedom Tower. Everyone tells me its incredible. Oh, that has got to be an extremely overwhelming and emotional sight. We will be in NYC this winter. I hope I am able to go. Super fun race outift and congrats on ramping up the mileage. July was a challenge for me in that respect due to travels but I was thrilled with how well my 15 miler went. Somehow the body remembers. Yay for Legoland! You did great work on your 15! We are being absolute beasts this summer! nice job getting your mileage back up with this heat! Love the VA Beach outfit! Thanks! It’s pretty awful slogging through this weather, but I’m not really sure what else we’re supposed to do. The miles have to get done, right? 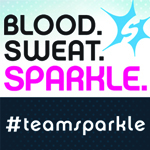 I am considering purchasing a Sparkle Athletic skirt. I am not sure how I will like it, but they look like fun. They are cute. I wear mine over long compression shorts and then kind of safety pin it low on my hips so that you don’t see the shorts sticking out. Your outfit for RnRVB is very bright and summery. Perfect for a race at the beach! I hope so! I’ve never done an RnR so I have no idea what people wear! I’m a mess! Good job on the training! And I love that outfit…I’m already thinking about my marathon outfit! 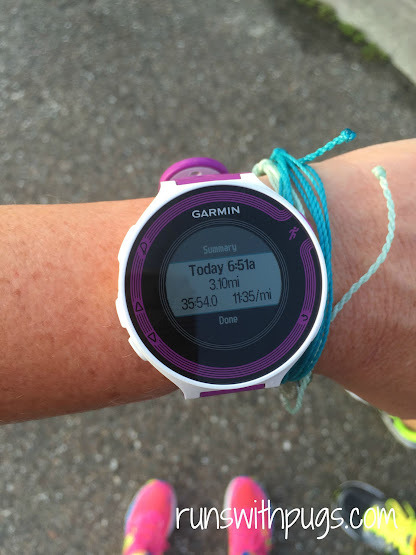 Wendy@Taking the Long Way Home recently posted…Marathon training week 2: Hallelujah! The outfit is a critical part of the experience! Love love the the skirt! Such a fun color. My kids loved Legoland when we lived in SoCal. 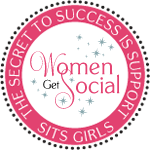 jill conyers recently posted…Are You Setting Smart Goals? I need to get out to the West Coast. There are so many great parks out there and I feel like we are missing out. Super cute outfit for VA Beach!! 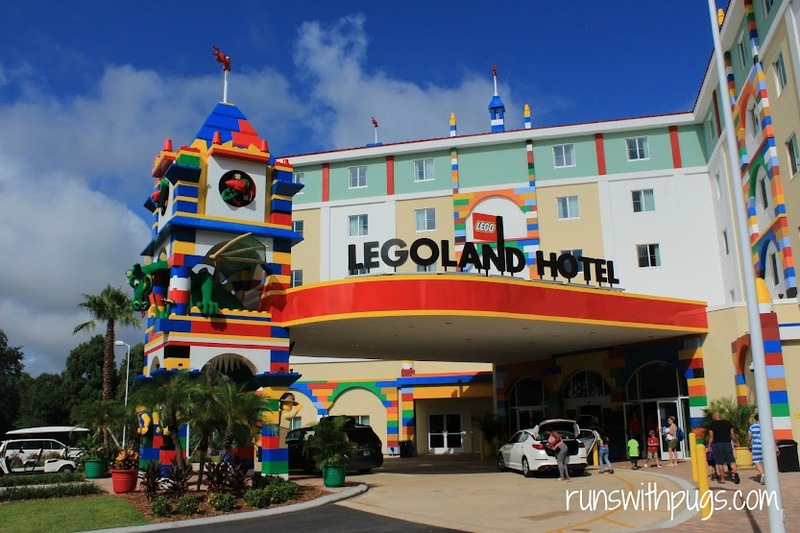 We almost booked a trip to Legoland last week, but the rooms were $600 a night on the days we wanted to go!! I couldn’t believe it!! And guess what….we booked a Disney cruise!!! SOOOO Excited! I know! The hotel is so freaking expensive, but they are operating at almost 100% capacity, so I guess it makes sense. when are you going???? I want to know all about it!!!! Oh wow – that picture of Blue Springs Park is gorgeous! My sons would have loved Legoland when they were little, too. Debbie @ Deb Runs recently posted…We Saw Pegasus At The Beach! There are some stunning sights in this state. I’m so glad I decided to just up and go. We actually have some pretty nice parks here in Maryland so want to explore them with the kids. Universal is awesome! You definitely should! It’s so cool seeing what is right in your own backyard. We love Universal. congrats on the mileage! Mine is creeping up too! I wish I would have known yo were at Legoland – I would have stopped by to see you! Mary Beth Jackson recently posted…Meatless with Freekeh! I didn’t realize it was close to anyone! It seems kinds of out there LOL! Next time! We are in Orlando quite a bit. Your family does the best things! Legoland looks like a blast. And I love the race outfit. Congrats on a great week of training! Great job! 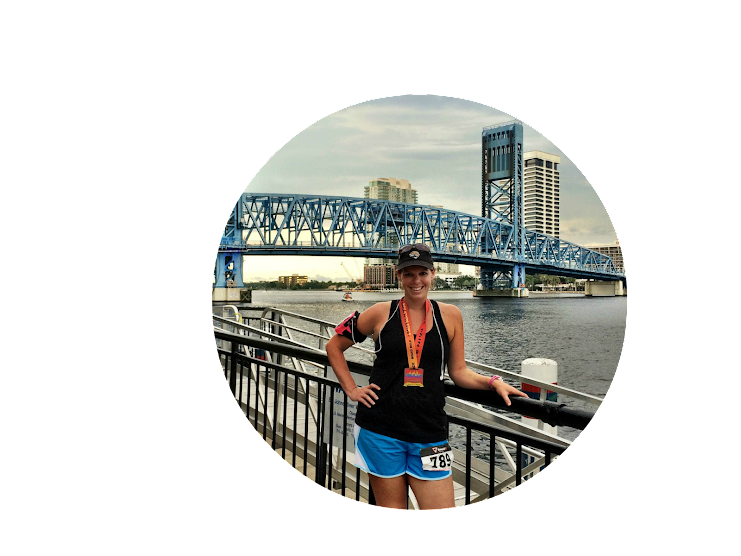 I love seeing where you ran this week… so pretty! We are very lucky to have some pretty routes around here! That blue springs looks awesome. I have so many local sites I want to visit but I also have a new house I want to put work in to. Haha. Ah, yes. Sometimes you have to go that route. I get it. We were there when we moved into our new house. Have fun decorating and fixing up! Sounds like lots of fun stuff this week! Great job on the mileage! It was a good week for running! I have two sparkle skirts and do not wear them often enough. Need to start planning my outfit for Chicago Marathon! Also, legoland looks really cool! Sparkle skirts are so fun. I don’t wear them a lot either, but when I am doing an awareness race or want to jazz things up, it’s my go to. Much easier and more comfortable than a tutu, for sure. I’m glad we were able to get some nice time away this summer. It’s been a good one for little vacations. They are some good monthly mileage levels you are achieving there. It is good to see how you fit the runs and funs in so well together. Thanks. I am working on it. I’m trying to balance life and running and all my other interests,and it does get overwhelming sometimes.